A copy of the formal complaint was forwarded to What if? Dunedin on Thursday, 8 November 2012. This item was published on 26 Oct 2012. The Board of Dunedin City Holdings Limited is very pleased to announce that Dr Ian Parton and Mr Dave Frow have been appointed as new Directors of Aurora Energy Limited (“Aurora”) and Delta Utility Services Limited (“Delta”). Both of the new Directors come to the Company with distinguished careers as engineers and extensive governance backgrounds. Effective from 1 November 2012, the directors will join Mr Ray Polson and Mr Stuart McLauchlan on the two boards which will comprise four members in the meantime. Dr Parton is a Distinguished Fellow and Past President of the Institution of Professional Engineers of New Zealand. Dr Parton was for fifteen years Managing Director of Meritec Group Limited (formerly Worley Group Limited) and more recently was Transition Chief Executive of Watercare Services Limited managing the integration process with respect to amalgamation of the wholesale and retail water companies which resulted from the “Super City” initiative in Auckland. Dr Parton is a Director of Auckland Transport Limited and Skellerup Holdings Limited and is also Pro-Chancellor of the University of Auckland. Mr Frow’s background since coming to New Zealand from South Africa in 1979 has largely been in the electricity industry. He worked with the Ministry of Energy for nine years before joining Electricity Corporation of New Zealand where he became Chief Executive in 1992 through until 1999. Subsequently Mr Frow has served on the Boards of Waste Management Limited and Unison Networks Limited. He was a member of the Telecom Independent Oversight Group through to December 2011 and is currently a Director of ETEL Limited and Holmes Fire & Safety Limited both of which companies are involved in the electricity industry. Mr Frow is a Fellow of the Institution of Professional Engineers of New Zealand. Dunedin City Holdings Limited is very pleased to have obtained the services of these two Directors who will bring to the Boards of Aurora and Delta vast experience in the areas in which each of these companies operate. Following agreement from the Dunedin City Council, Dunedin City Holdings Limited is pleased to announce the names of two new directors for the board of City Forests Limited. The appointments are to be effective from 1 November 2012. The two new directors, both from Dunedin, are Mr John Gallaher and Mr Tony Allison. They will join Mr Ross Liddell and Mr Mike Coburn on the board which will comprise four members. Mr John Gallaher is a senior investment professional with Forsyth Barr Limited who began his commercial career with roles in banking, finance corporate management and marketing 35 years ago. John is Chairman of TracPlus Global Limited, Daestra Holdings Limited, United Way NZ Limited, Tui Motu Foundation Inc. and the Upstart Investment Committee and he has several other directorships. Mr Tony Allison is currently the CEO of Night ‘N Day Foodstores Limited that in the last few days ranked very highly in the Deloitte Fast 50 List. Prior to that he was the Chief Operating Officer and a director of Calder Stewart Industries Limited where he gained experience of forestry operations. Tony is also currently a director of AA Cleaners (Otago) Limited, St Clair Beach Resort, Southern Team Co 2008 Limited and the Southern Steel Netball Team. Both these two Dunedin directors have excellent corporate governance understanding and collectively they will bring to the board experience of governance and the forestry industry relevant to the business of City Forests Limited. 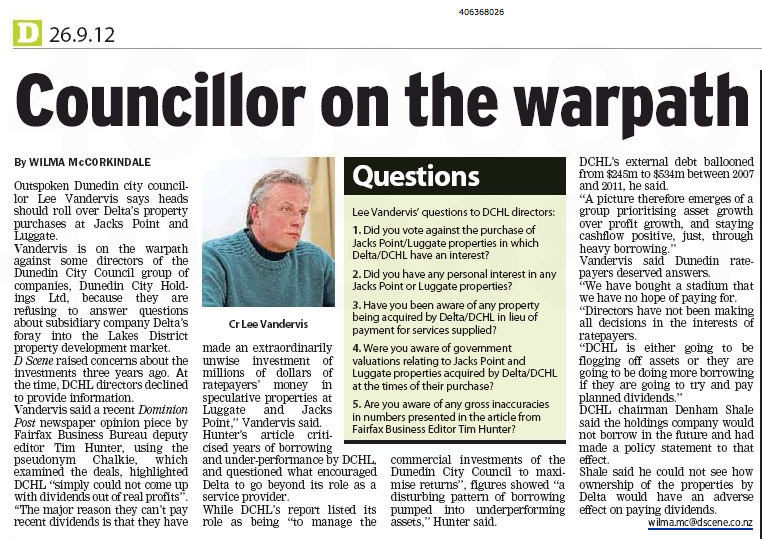 Contact Denham Shale, Chairman, DCHL on 021 375 112.